Brewing something creative isn't just adding an unusual ingredient, using some long forgotten technique, or fermenting with something besides Saccharomyces (although I do enjoy all those things) it is also combining ingredients that don't usually get put together. To be innovative you don't need to follow the Dogfish Head model, think about flavors from different beer families that might work well together and give it a shot. The hop harvest ale I brewed a few weeks back was essentially a slightly strong kolsch (~6% ABV) hopped with Cascades and Willamettes that we picked during the boil. Nothing too crazy, but a combination of ingredients that I had never heard of before. Kolsch yeast adds winey esters, so I thought it would be an interesting pairing with the fresh grassy English and American hops. I wanted the interplay of yeast and hops to be center stage, so I kept the malt bill simple and out of the way. 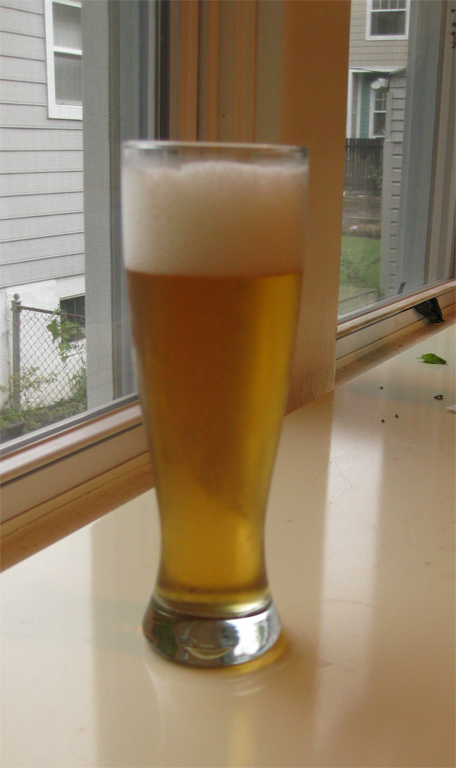 I did make a silly mistake with my process though; I bottled the beer too soon. The Wyeast Kolsch strain I used is one of the slowest, laziest yeasts available . After two weeks the gravity was about what I expected, but there was still a thin krausen floating on the surface. I needed the yeast cake for a Smoked Baltic Porter, but instead of racking to secondary (like I should have) I decided to bottle the harvest ale. The beer quickly carbonated, and within 2 weeks was a bit over-carbed, at which point I moved it to the fridge to prevent any further refermentation. Appearance – Crystal clear yellow in the direction of gold. Nice dense three finger white head that just won't quit. Smell – Hints of citrus and spice, but it has a disappointingly low level of hop aroma considering the big addition at 5 minutes. Faint white wine character from the yeast. Pretty clean overall. Taste – Pretty mellow, but with a nice bready malt backbone. The bitterness is assertive, but it is clean and doesn't linger. There isn't much hop character besides the bitterness, just some hints of fresh mown grass. The finish is crisp and short. Mouthfeel – Firm, prickly carbonation. More bubbles than I intended, but it actually works pretty well for this beer. Medium body that feels substantial without detracting from the refreshment. Drinkability & Notes – Not bad for a big kolsch, but the lack of hop complexity is disappointing for a Harvest Ale. Not sure if I should blame my first year harvest, or if I simply didn't add enough wet hops. It's first year hops. They tend to be lackluster and low in the good stuff we want out of them. Next year won't be quite up to what you expect, either. After that you'll see the real stuff. +1 on the 1st year hops. though it was a great growing season out east vs. northwest, but first year hops...even if they appear to be big, robust + have visible lupulin, they are grassy/chlorophyll-y. the full flavor will start to show next year, then all bets are off after that. I think to maximize the delicate volatiles, I'd simply add at flame out. not that I've done one yet...just a personal impression of the eventual impression intended with a fresh hopped beer.